Electric utilities have turned to natural gas for electricity generation because of its low prices and because of onerous regulations affecting coal plants from the Environmental Protection Agency (EPA). Natural gas emits about half the carbon dioxide emissions that coal emits and is dispatchable, which means it can be turned on and off by an electric grid systems operator and thus can be used to back-up renewable technologies such as wind and solar when the wind is not blowing and the sun is not shining. Its dependability as a generating technology, its low fuel cost, and its lower emission rate make natural gas an important generating source for electric utilities. So much, in fact, that in April 2015, natural gas surpassed coal in electricity output, generating 31 percent of the nation’s electricity to 30 percent for coal. [i] Coal, in the recent past, had been generating 50 percent of the nation’s electricity. 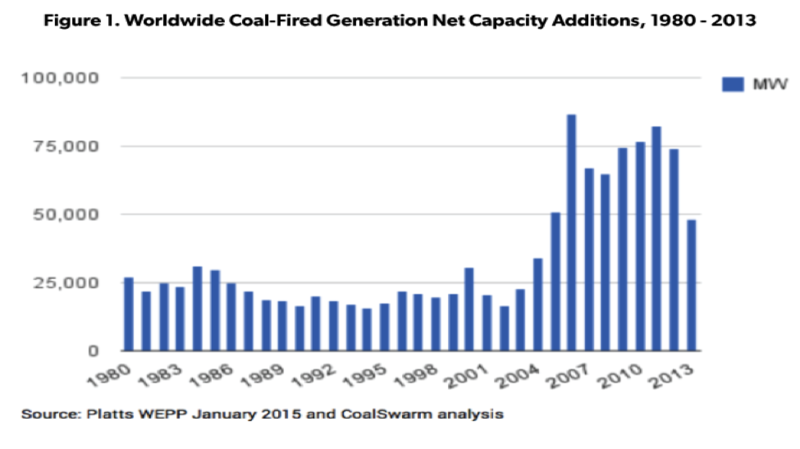 However, one needs to question whether natural gas is the answer for replacing coal in the generation sector. Natural gas has numerous uses—for heating and cooking in the residential and commercial sectors, as a fuel in manufacturing processes in the industrial sector, as feedstock for chemical and agricultural uses and as a generating technology in the electric sector. Because of its numerous uses, it has often needed to be rationed or prioritized with the residential sector generally receiving priority. For example, in the Northeast during the polar vortex, pipeline capacity was so constrained that the cost of generating electricity from natural gas rose to astronomical proportions. Where dual-fired capacity was available, such as in New York, oil was found to be cheaper than gas and was used instead. But, coal and nuclear units were used heavily to get the Northeast through the cold spell. Since then, coal and nuclear units have been retired due to pressing environmental regulations. But winter is not the only time of the year when the generating sector has problems receiving enough gas to meet demand. This summer in California, temperatures have hit the 90s and air conditioning units have been run at full force. The Independent System Operator (ISO) for the state called on consumers to conserve energy due to constraints on its gas supply. Luckily, demand response programs and conservation alerts kept demand below levels that would have resulted in black-outs. When the alert was issued on June 30 and July 1, wholesale power prices increased 51 percent in Northern California and 44 percent in Southern California. If it were not for natural gas in storage, matters would have been much worse. Electric utilities across the western part of the nation withdrew 1 billion cubic feet of gas from storage to meet demand in the week of the alert when they typically add 11 billion cubic feet into storage. California’s energy policy, calling for a heavy level of non-hydroelectric renewable energy and large emission reductions is putting a strain on its utility generation system. [ii] Because it needs reliable power, it has turned to natural gas. Since 2003 — when the state enacted its renewable portfolio standard — natural gas supplied 62 percent of the 21,000 megawatts of new electric capacity. California’s policies are not for the rest of the nation to emulate because of its mild climate that does not rely on heavy heating and cooling, its importation of reliable power from neighboring states, and its lack of an energy-intensive manufacturing sector due to its higher energy costs. States with a more extreme climate and a job-producing manufacturing sector need to generate reliable power. The demise of the U.S. coal sector will result in increased consumer prices for electricity, a less reliable electricity grid, and a generating sector subject to brown outs and black outs. U.S. electricity consumers and their elected representatives need to pay attention now to onerous environmental regulations on the U.S. electricity sector. While the United States will be retiring its coal units, other countries will be building them to fuel their economies and to bring their citizens out of poverty. The United States will be made an example, but for no net environmental gain. Natural gas is a good fuel, but it should not be relied on to supply all of the country’s needs. A diversified energy sector is important and coal needs to remain a part of it.